I remember the day my wife (then girlfriend) told me she wanted to stop eating meat. She was never much of a meat eater but always ate what I cooked. In those days my food was pretty standard fare. Meat. Vegetable. Starch. The occasional meatless dish usually featured pasta, and even then hopefully a sausage link or meatball or two on the side. So I mourned. Not only for the ease of ordering and restaurant selection but for the style of cooking I had begun to develop. What would I cook? Did I now have to make two versions of everything? What about the meeeeattttt? Now years later I (again) have my wife to thank for another transformation. These days I cook meatless more than not. I’m not talking about tofu flavored sprouts or factory made “chik’n”. I hate that stuff. I’m talking about hearty, delicious entrees that fill you up and don’t leave you lacking. When cooking vegetarian the key is to work protein in as much as possible. 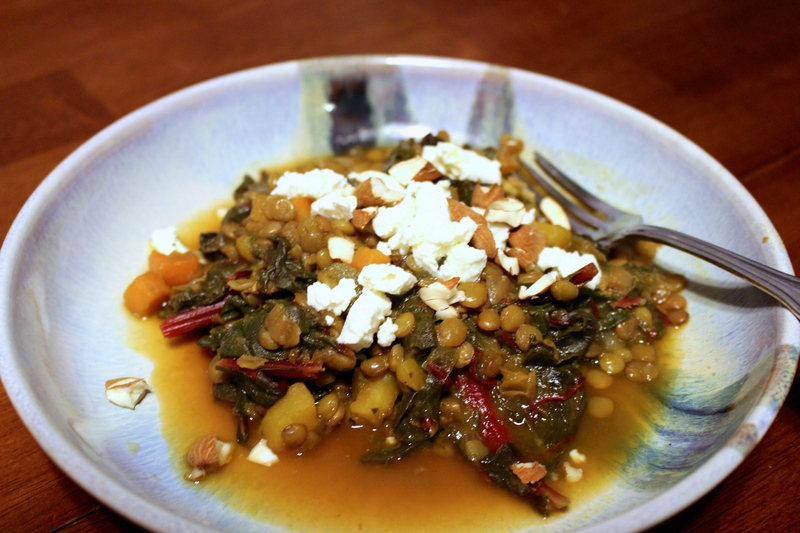 This dish, with lentils, swiss chard, almonds and feta is loaded with protein and vitamins. The use of oregano, sage and fennel seeds give the lentils a very meaty flavor. Don’t feel up to a vegetarian dish tonight? Brown some sausage and add it to the mixture at the end. Start by chopping up your veggies. Dice them up pretty small, especially the carrots. Heat up some olive oil on medium high and get those onions in the pot. Salt, pepper, a layer of sage, oregano and two dashes of fennel seeds. Add the celery and carrots. Shake out another layer of sage and oregano. Toss in the chopped garlic. Stir. Once that has all started to work together pour your vegetable broth over the whole thing, dump in your lentils and cover. Add a bay leaf and turn the heat to medium. Now for the swiss chard. This is a pretty robust leaf. If you bought it from a farmers market or in a bunch like me it’s quite the handful. I filled up the clean sink with cold water and broke the chard down by hand into more manageable pieces. Remove the really big stalks with scissors or a knife and work your way through it all, stopping occasionally to stir your lentils. You want them on a light boil and the cover on so you don’t reduce the liquid too much. Run your swiss chard through a lettuce spinner. If you don’t have a lettuce spinner you’re in for some work. You should buy one anyway. Next time. Shake the leaves out by hand, press them with dish towels and accept that they’re going to have some moisture on them. No big deal. At this point I would take the cover off of your lentils and let the liquid reduce down to about half of its original volume. 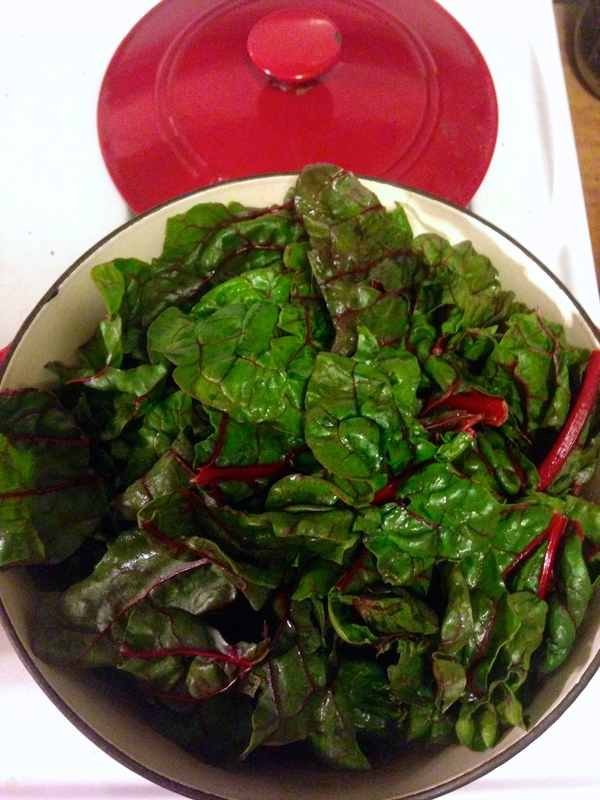 Add the chard in batches, filling the pot, covering it, stirring it, covering it, repeat. You may think it can’t handle more but don’t worry it will reduce considerably. Add some more herbs. Salt and pepper again. Once you get the chard in stir occasionally while letting it cook. Chop up some almonds and toss them in a small skillet on medium low heat. Let the almonds toast up with an occasional stir. Taste the lentils. Too firm? More time. Liquid reduced too fast? Add some water. Watery? More heat, less cover, more spices. The lentils and chard are done when there is enough liquid left to be a sauce but not quite a broth. Add the lemon juice, give it a good stir and turn off the heat. Give it 5-10 minutes to cool down a bit and let the flavors calm down and mix together. Scoop on its own or over a grain. Add the almonds and some feta cheese at the end. wonderful blog piece and easy, clear directions. Looks delicious and Im trying it this weekend.